The Smaller Sukhavativyuha Sutra (Skt. Sukhāvatīvyūhasūtra, Tib. བདེ་བ་ཅན་གྱི་བཀོད་པའི་མདོ་ , dewachen gyi köpé do, Wyl. bde ba can gyi bkod pa'i mdo) (Toh. 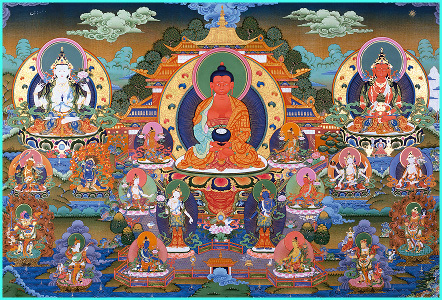 115), which takes place in the Jeta Grove, contains a description of the Sukhavati pure realm of Buddha Amitabha. It was translated into Tibetan from Sanskrit by Shyang Yeshé Dé. The Sanskrit term vyūha (Tib. བཀོད་པ་, köpa, Wyl. bkod pa) means display: the sūtra is a description of the Sukhavati pure realm and its characteristics. This page was last edited on 23 June 2018, at 19:20.